My dad loves Chinese food but unfortunately there aren't any good restaurants in our area. Chinatown in Philadelphia has great food, but it's a bit far to travel to satisfy a craving. So when I asked my parents to come over for dinner today, my mom suggested I make Chinese food. We started with some edamame to snack on. Yes, edamame is normally a Japanese appetizer, not Chinese, but it seemed to go! 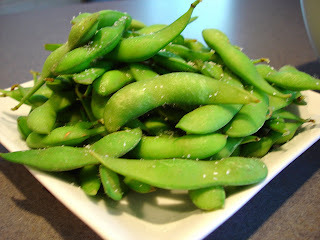 I boil the edamame for 3-5 minutes until tender, drain, then sprinkle with Kosher salt. To eat the edamame you scrape the pod along your teeth to remove the beans inside. So yummy and a healthy snack, too. For dinner I made my Vegetable Lo Mein and some Asian Beef. The amounts for the marinade are estimates since I kept putting things together until the aroma was just right. Combine all of the marinade ingredients, adjusting any amounts to smell. Pour over the chopped steak and marinate for several hours. When ready to cook, put a few pieces of steak onto each skewer. 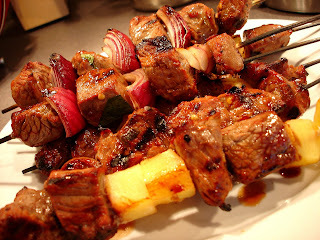 I also added some red onion to some skewers and pineapple chunks to the others. Grill for 10 minutes or so, until done. Mmm, this marinade was great! It was a touch sweet but also savory. Marinating the sirloin made it really tender. I'd definitely use this marinade again. I think it would also work on salmon, chicken, or shrimp. My Vegetable Lo Mein recipe can be found here. Tonight I used red and green pepper, sprouts, broccoli, water chestnuts, bamboo, green onions, and carrots. We finished off the meal with some fortune cookies and some of my dad's amazing raspberry thumbprint cookies. I HAVE to get his recipe to post!! The whole meal looks great!! Wow! That all looks so good! Hi Mary Ellen. Thanks for linking this in to Food on Friday. Have a great week. PS It would be lovely if you followed Carole's Chatter. I will follow back - although that would be easier if you had a Google Friend Connect follower thingy in your sidebar.